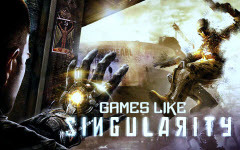 Games Like Singularity: Survival FPS '+g+"
Singularity is a first-person shooter with survival-horror elements developed by Raven Software and published by Activision and released for Microsoft Windows, PlayStation 3 and Xbox 360. The player take on the role of Captain Nathaniel Renkoa, an US Air Force pilot provided with an artifact known as the Time Manipulation Device (TMD) which can manipulate time. If you are a fan of first-person shooter games like Singularity and looking for more games with similar gameplay then find the recommendations for it below and don't forget to mention if we miss any games as we keep on updating this list. BioShock is a first-person shooter survival horror video game series with role-playing elements developed by Irrational Games. In the first two games, the player explore Rapture, defending themselves from attacks from Splicers along the way as they complete missions given to them by the few unaffected survivors and the third game (BioShock Infinite) carries many of the same gameplay concepts from the BioShock title even though it is not a direct sequel or prequel to the original game. Metro 2033 is a first-person shooter video game, developed by 4A Games in Ukraine and released for Microsoft Windows and Xbox 360. The game is played from the perspective of Artyom, the player-character. The story takes place in post-apocalyptic Moscow, mostly inside the metro system, but occasionally missions bring the player above-ground. Dead Space 2 is a third-person shooter survival horror video game developed by Visceral Games and published by Electronic Arts. Set three years after the events of the first Dead Space, the game follows protagonist Isaac Clarke's fight against a new Necromorph outbreak on the Sprawl, a space station above Saturn's largest moon, Titan. Borderlands is an action role-playing first-person shooter video game, that was developed by Gearbox Software. Borderlands is set on the planet of Pandora. Lured by its apparent vast deposits of minerals, several colonization ships sponsored by the Dahl Corporation journey to the planet and build settlements there. Halo 3,.....if you can think of more, then don't forget to mention it in comments.